A recent study by the Commonwealth Human Rights Initiative (CHRI), a well-known rights-based NGO with presence in several countries, has revealed that Gujarat, which happens to be Prime Minister Narendra Modi’s “model state”, has experienced one of the lowest conviction rates in corruption cases registered during 2001-15. Bases on an analysis of the National Crime Record Bureau (NCRB) data of 15 years, CHRI in its report “Fact and Fiction: Governments’ Efforts to Combat Corruption”, prepared by right to information (RTI) activist Venkatesh Nayak, says, out of a total of 49,28,153 criminal cases registered in Gujarat during the period, just about 3148 (or 0.06%) related to corruption. Pointing out that this is equal to the national average, the report says that the states where a higher percentage of corruption cases than Gujarat vis-à-vis total number of criminal cases were registered are Haryana (0.2%), Himachal Pradesh (0.42%), Jammu & Kashmir (0.26%), Karnataka 0.22%), Maharashtra (0.17%), Odisha (0.47%), Punjab (0.38%), Rajasthan (0.2%), and Telangana (0.13%). 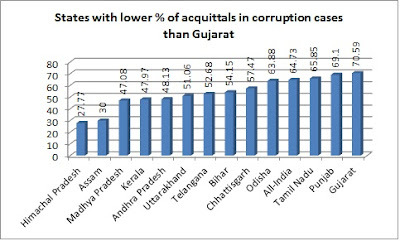 As for acquittals because of court trials, the report states, in Gujarat these were 70.59%, one of the highest in the country among big states. While the all-India acquittal rate, 64.73%, is much lower than that of Gujarat, the states which experienced lower acquittal rates include Andhra Pradesh (48.13%), Assam (30%), Bihar (54.15%), Chhattisgarh (57.47%), Himachal Pradesh (27.77%), Kerala (47.97%), Madhya Pradesh (47.08%), Odisha (63.88%), Punjab (69.1%), Tamil Nadu (65.85%), Telangana (52.68%), and Uttarakhand (51.06%). Higher number of acquittals has happened in Gujarat even as Haryana was found to be topping the list with 86.10% (2,106 against 2,446) of corruption cases being registered, followed by Gujarat 81.26% (2,558 out of 3,148), Maharashtra 72.10%, Himachal Pradesh 67.78%, Karnataka at 62.51% and Jammu and Kashmir at 54.64%. Higher acquittal rates in Gujarat has come about against the backdrop of the Corruption Perception Index (CPI) figures for 2015 released by reputed consultants, Transparency International, in which India ranks 76th among 168 countries surveyed for people’s perceptions about corruption. Countries like Bhutan (27), Chile (23), Ghana (56), Jordan (45), Namibia (45), Panama (72), Rwanda (44), Saudi Arabia (48), Senegal (61), Seychelles (40), South Africa (61) and Uruguay (21) scored better than India on CPI. In the BRICS grouping, India keeps company with Brazil at 76th place while China is at 83 and Russia far below at 119. Giving a comparison of corruption with other types of cases across India, the report reveals, during 2001-15, the NCRB reported the registration of 5,01,852 cases of murder, as against only registration of just about 54,139 cases of corruption. “In other words, for ten murders registered, only one case of corruption was registered across the country”, the report states. Then, says the report, during this 15-year period, the NCRB reported the registration of 5.87 lakh cases (5,87,347 cases) of kidnapping or abduction across the country. “In other words, for 11 kidnappings or abductions registered across the country, only one case of corruption was registered by the law enforcement authorities”, says the report. “This comparison seems to indicate severe lack of public confidence in the ability of the anti-corruption agencies to investigate a complaint of corruption, collect evidence and put the case up for trial”, comments Nayak.